Fictional mad scientists usually meet a dreadful fate: destroyed by their own creation, or by villagers with torches. After all, we can't send the message that dabbling in the universe's secrets is okay. But sometimes, a scientist is just too clever, or lucky, to get burned. Here are 10 mad scientists who didn't get punished. Good news, everyone! Nothing particularly bad happens to Futurama's mad scientist, Professor Farnsworth. This senile genius has the manical laugh down (see video!) and spends most of his time coming up with wonky experiments. He plays God numerous times throughout the series with his obsession with Doomsday Devices, parallel universes, cloning, and his creation of the Atomic Supermen among other things. As of the most recent "final episode" of the show, Farnsworth hasn't suffered any serious repercussions. 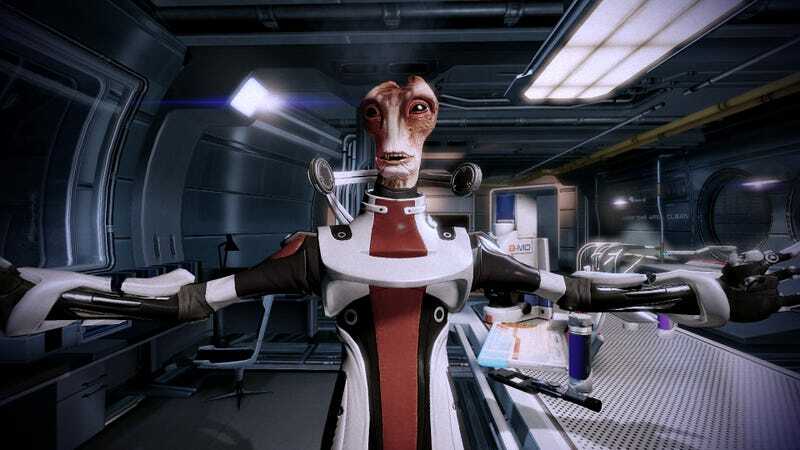 Mordin Solus is a brilliant salarian scientist who was vital in modifying the horrifying Krogan Genophage. The original genophage was a biological weapon used against the Krogans during the Krogan Rebellions. It genetically modified the entire species to make a viable pregnancy very rare, leading to many stillborn and sterile Krogans. After a few centuries the Krogan were beginning to be resistant, and more children were being born healthy. Solus was part of a team that modified the genophage to keep the population down. He truly believes that his actions were justified, and feels no guilt over what he's done to the Krogans. Mordin's end varies depending on how you play the game, but he is never brought to justice for his hand in the genophage. Doctor Krieger doesn't technically have an advanced degree, but that doesn't stop him from using the title and performing all kinds of insane experiments. As head of the ISIS Applied Research Department, Krieger performs genetic experiments, creates robots/cyborgs, invents spy cars, and invents new ways of doing drugs. Despite the sometimes frightening nature of his work, his bosses at ISIS never reprimand him. He is allowed free reign, and he definitely takes advantage of it. Dr. Helen Narbon and her mother, Dr. Helen Narbon, are both mad scientists in this acclaimed webcomic. They both like to occasionally play God, conducting experiments that range from human cloning, to brain uploading, to genetically engineered gerbils. While they both deal with ups and downs over the course of the comic, nothing truly bad ever happens to them as a result of their mad science. Underneath that pink, princessey exterior, Princess Bubblegum is a ruthless mad scientist. Throughout the course of the show, we see her playing God in her candy kingdom. She tears the limbs off of tiny people (see video above), creates life in the form of the Lemongrabs and Goliad, and even makes a robotic clone of herself. She's willing to do just about anything in the name of science. And yet, despite her dark streak, she is beloved by most of the inhabitants of Oo. D.A. Sinclair is the creator of robotic zombies called Reanimen. He started his experiments on dead bodies, but eventually moved on to live ones. He even tried to use his roommate, William, as a very unwilling guinea pig. Sinclair is arrested for his horrific crimes, but the government decides that his talents are too special to go to waste in a jail cell. He serves no jail time, instead getting a government contract to turn his Reanimen into super soldiers. The leader of the Fantastic Four definitely plays God on a pretty regular basis, developing huge Weapons of Mass Destruction and attempting to be the Marvel Universe's version of Hari Seldon from Asimov's Foundation. Just his habit of opening doorways between universes, alone, is enough to mark him as "Playing God" — and when we meet his alternate selves from other universes, they're nasty pieces of work. And Reed does go through some hardship, in the usual "comic-book character" way: his face gets scarred, he's shot, his friends and family die, he's put on trial, he's dying of a mysterious illness — but none of these things is permanent, or lasts much longer than your usual comic-book tribulations. Reed usually winds up having his nice lab at the Baxter Building once more, surrounded by his team and his kids, having jolly banter around him. We debated whether to include Walter, since he definitely suffers — he loses his wife, and spends time in a mental institution. But then Walter's life gets better, and he winds up having a pretty nice existence as a member of the Fringe Division. Especially considering the huge amounts of destruction and misery Walter caused, Fringe keeps teasing us with the notion that Walter's real punishment is yet to come. In particular, we're shown an alternate future where Walter is a broken man, and we're also given hints that his alt-universe son Peter may have to die to balance the scales. In the end, though, Walter winds up as a pretty well-adjusted, happy guy who helps stop an invasion from the future. Even his final sacrifice is not actually that onerous, all told.